The world’s largest online poker room, PokerStars, has found a new way to bring their massive community of poker players together; by creating PokerStars Home Games. 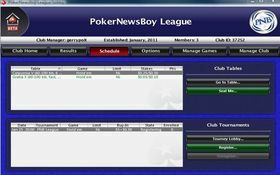 Home Games allow players to create and manage private poker leagues for their friends and family by making each individual league password protected and giving the league manager the option to invite people to join. Each league can have a maximum of 50 members, and players can only be active in three leagues at any one time –players are also only allowed to be League Manager of just one club. Home Games can be played for either Real-Money or Play Money, and the league manager and administrators can create both tournaments and cash-game tables. Leagues can choose to have their tournament results tracked by PokerStars, where the site will award points to each player based on their finish and keep a league leader-board –tracking everything from prize-money to average finish to number of knockouts. One thing players will notice is that Home Games don’t fall under the strict terms and conditions of other PokerStars games and players are allowed to play at the same table even if they are sharing an IP address or playing from the same address. · Club Management Tools – appoint administrators, accept/remove members, customize your club lobby, set length of club seasons, and more. Judging by the number of leagues already created, PokerStars Home Games looks to be a major hit, and is a great way to reconnect with poker players from your past that may not live close enough to play in your home game anymore. If you want to join the PokerNewsBoy PokerStars Home Game, click here for info. This entry was posted on Monday, January 24th, 2011 at 11:22 am and is filed under Poker Promotions. You can follow any responses to this entry through the RSS 2.0 feed. You can leave a response, or trackback from your own site.